In a ye ar filled with so many low points, it's nice to have something to look forward to. And as always, the geniuses at Pixar come through and give us "Up", their latest computer animated feature film filled with some of my favorite things including zeppelins, a cameo of the legendary Fenton's, the East Bay ice cream emporium and a cranky old man whose sour appearance hides how sweet everything actually is. Pixar continues to recognize that their success is built by the talented people who work there, and rotates through its roster of directorial ringers. This time it's Peter Doctor's turn, who led the charge on previous Pixar features like "Monsters Inc.", and he co-directs "Up" with writer Bob Peterson, who also steps in as the voice of Dug, the lovable puppy that thanks to a pretty funny collar gimmick, can speak his mind. "Squirrel!" 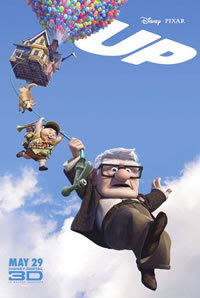 Pixar continues to raise the bar on themselves, and beyond the fantastic animation skills displayed, "Up" is filled with a lot of heart and lifts its audience to experience new emotional highs and lows. So much so, that at times, I speculate that some parents may have to do some serious hand-holding with sensitive kids who may be spooked by the emotionally charged scenes. And while the tradition of plunging the depths of the hopes and fears of children has been part of the Disney repertoire since Bambi's mother died in the forest fire, "Up" presents in an elegant and caring way several deeply human themes. In one montage we see a subtle yet effective retelling of the main characters lives and the difficulties they endured covering real life issues such as financial burdens, unable to conceive children of their own, and having to contend with the loss of a spouse. And while these themes sound pretty heavy handed for a kids movie, in Pixar's hands these hardships are used to frame the heart of gold that lives inside. Up's true message lies directly in the center of love conquers all, and with some determination, planning, and the help of your wacky friends and thousands of helium filled balloons you can achieve your life long goals and learn what's really important along the way. After seeing the early Pixar short film 'Knick Knack' receive the 3D technology treatment when it was featured in the re-release of the Nightmare Before Christmas a few years ago, I longed to see the Pixar people apply their powers toward creating an original full length movie that is meant to be seen in 3D. "Up" is the first Pixar movie to get the new 3D glasses treatment, and they exceed the standards by seamlessly integrating the technology and choosing the perfect blend of elements to focus on, so that the 3D effect is woven into their storytelling tapestry. And perhaps it's the custom glasses that resemble the thick black rim frames of Up's lead character voiced by the awesome Ed Asner, the eyestrain from watching the 96 minute movie is barely noticeable compared to other 3D films. Big thanks to everyone at Disney and Pixar for reminding us that even in the darkest times, there's always a good reason to look "Up". For Movie Magazine this is Purple.